An Access control system enables companies more complete control over entrances to their facilities. It provides documentation, giving an audit trail of who enters or exits and when. More practical is the ability to surgically remove a key from the system without the hassle and expense of changing locks and issuing new keys. BSC delivers access control solutions using state-of-the-art technology. Our manufacturers are rated top in the industry for product quality, connectivity, and ease of use. Access control systems provide advanced technology with innovative scalability for any size facility. They cover everything from a keypad on a single door to a fully networked system for an entire campus. Stand-Alone systems are self contained. No PCs or external programmers are needed. Networked or Computer Interfaced systems work with a PC. Both local (LAN) and wide area networks (WAN) are supported. an access control card with a strip of recordable magnetic material on which data is recorded. It is designed to swipe through a magnetic stripe reader installed at the opening. The reader is capable of reading and interpreting the card's data. an identification process made using biological characteristics (e.g., fingerprints, hand geometry, voice analysis, and retina patterns). a method of reading a card or key tag without requiring any physical contact between the card/tag and the reading device. 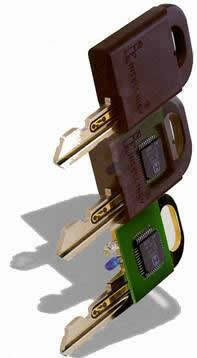 include an intelligent key, electronic cylinder, intelligent lock controller and software for standalone applications. When a system is hardwired, all programming, auditing, and updating can be accomplished from one location. PC based access systems can accomplish all of the above remotely (off site). In the event that it is not feasible, due to budget constraints or the building's architecture, there are reliable battery powered systems available as well.